Rachel is the Professional Development Manager at iEARN-USA. 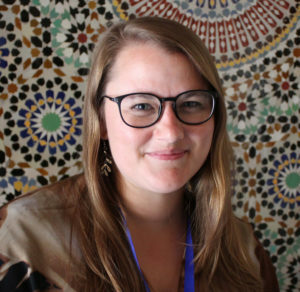 Rachel’s current role is to support educators in iEARN’s virtual exchange programs through online course design, curriculum and resource development, workshop facilitation, and program evaluation. Rachel was an educator for eight years prior to joining iEARN-USA. She taught abroad in Namibia and co-taught in a 4th grade classroom in Wisconsin. She holds a Master of Education from University of Wisconsin-Madison in Curriculum and Instruction. Her graduate research focused on the use of technology-enhanced environments to increase global understanding and literacy practices. She hold a Bachelor of Arts in Elementary Education and Special Education from The University of Iowa.